Maysee McLean cast as lead in "Peter and the Starcatcher"
Maysee McLean from Strathroy, who is a new face of iFilmGroup and m & s Marshall Productions has been cast as the lead female role of Molly in Strathroy District High School Production of the Tonywinning “Peter and the Starcatcher “. The play upends the century-old story of how a miserable orphan comes to be The Boy Who Would Not Grow Up (a.k.a. Peter Pan). The play is based on the 2004 children’s novel “Peter and the Starcatcher” by Dave Barry and Ridley Pearson and freely adapted for the stage by Rick Elice. It is billed as prequel to Peter Pan and provides a backstory for the characters of Peter Pan, Mrs Darling, Tinker Bell and Hook, and serves as a prequel to J.M. Barrie’s Peter and Wendy. The play was conceived for the stage by directors, Roger Rees and Alex Timbers, and written by Rick Elice, with music by Wayne Barker. From marauding pirates and jungle tyrants to unwilling comrades and unlikely heroes, “Peter and the Starcatcher” playfully explores the depths of greed and despair... and the bonds of friendship, duty and love. The play is seen as a coming-of-age adventure story about how a nameless orphan -- inspired by a remarkable and ambitious girl -- became the strange and celebrated hero that is the "Boy Who Would Not Grow Up". The production is billed as “a wickedly imaginative play”, in which we meet a poor orphaned child on the high seas simply called “Boy” because, in the absence of a mother and a father, he was never given a name. His sad and lonely world is turned upside down when he meets Molly. The daughter of famous Starcatcher Lord Astor, our heroine is on a mission to save the world and protect a treasure trunk filled with magical star stuff from getting into the hands of evil and greedy pirate Black Stache. As they travel aboard the Neverland ship headed for a faraway land, Molly and Boy learn about love, friendship and forge an unbreakable bond. The role of Molly in the production allows Miss Maysee McLean to do two things she loves to do. Sing and act. “I’m super excited to have been cast as Molly” says McLean about being cast in the lead female role and being a part of the production. “Molly the Starcatcher is a very confident, strong willed and intelligent girl who will risk everything for the sake of doing right”, McLean goes on to add. 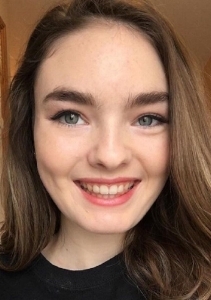 Maysee McLean stepped into the spot light of iFilmGroup and m & s Marshall Productions when she attended an open casting audition call in January. She impressed the Audition panel and came out of those auditions in the weeks that followed cast in three roles. She has been cast as Piper Keys a troubled street teen in Matthew Marshall m & s Marshall productions drama Blue Love. McLean has also been cast as part of the iFilmGroup’s promotional video that currently is in production to be a tool to help show people what iFilmGroup is doing. She has also been cast as part of a number of people doing some dramatic shots for additional footage for the short film Struggles Within. She had a very successful iFilmGroup Production day in early March before she has now turned her focus towards getting ready for the play. She can be seen at this Strathroy District Collegiate Institute’s version of Peter and the Starcatcher being shown Thursday May 3rd, and Friday May 4th @7:30pm.